Enabling HDR on iPod Touch 4G with Limera1n and GreenPois0n iOS jailbreak tools. HDR which is an iPhone 4 exclusive feature can now be enabled on your iPod Touch 4G thanks to the latest Limera1n and GreenPois0n iOS jailbreak tools. As you know that the HDR feature in the iPhone allows you to take much more detailed pictures/photos than normal camera photos. You can check it out here. But you need to have a jailbroken iPod touch 4G running iOS 4.1 to enable this feature. You can follow the guide here to jailbreak your iPod touch 4G. 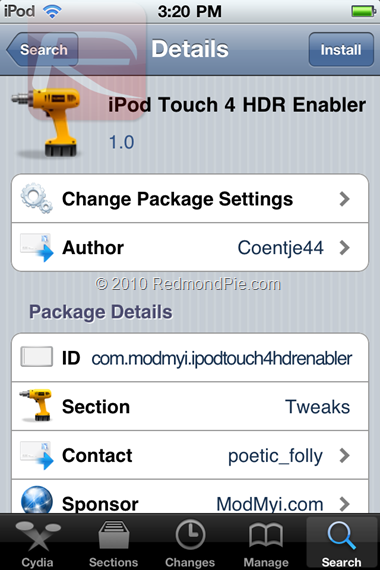 “iPod Touch 4 HDR Enabler” can be downloaded from Cydia for free under ModMyi repository. Once you have downloaded it, simply activate it from Winterboard app.